TerraDent's dentist-designed handle provides proper grip for better hygiene. Look at the underside of TerrAdent's Replacement Head This unique thermowelded technology fuses together each individual bristle, creating a solid head. Thermowelding eliminates spaces between the bristles where harmful bacteria hide and breed. Your bacteria-laden toothbrush can spread harmful bacteria to all parts of your mouth! In tests conducted at a leading Dental School, TerrAdent demonstrated the lowest bacterial load of all brands tested. Patented thermoweld technology also eliminates the metal staples, inserted deep inside each bristle tuft, that all other brands use to attach their bristles-metal that, with time, can corrode and leach. 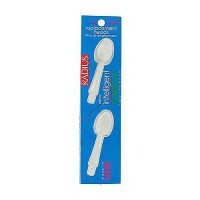 Replaceable Toothbrush Head for hygiene, budget, and your planet! Replacing your recyclable Head reduces plastic use up to 95% vs other brands-even recyclable ones! Only TerrAdent meets all 3 Environmental Imperatives: Reduce, Reuse, and Recycle. 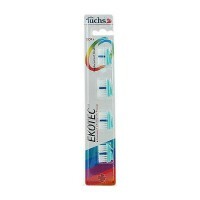 Flexible Neck distributes brushing pressure better to protect gums, Ergonomic Handle provides for better grip and brush control. 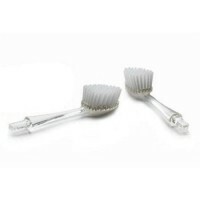 3 recyclable nylon bristled toothbrush heads made fro 80% recycled material. Remove worn Head as shown. Clean Handle. Insert Replacement Head. Press in Head until you hear "CLICK!" head is now safely and securely in place.